Many artists like to work on more than one piece at once, and I do too. If you get stuck, or tired of puzzling out one piece, you can shift gears to another. Right now I have about five projects going, though, and that's too many. It's just making me nuts. This is not the first time this has happened; I seem to be a slow learner regarding where exactly the sweet spot is for me. Sigh. But we all know the siren call of the new idea, the seductive thrill of beginning something new that will be the most exciting thing ever, right? 1. On the floor loom, two Tencel twill scarves, in belated fulfillment of an order from my very patient sister-in-law last Thanksgiving months ago. The first scarf is a sort of buffalo check, taken straight from the color gamp I did a few years back. You can see it to the left of the orange line that divides the two scarves, winding around the cloth beam. The second scarf features a straight diagonal twill with occasional veers into the other diagonal direction, at roughly Fibonacci intervals. 2A. 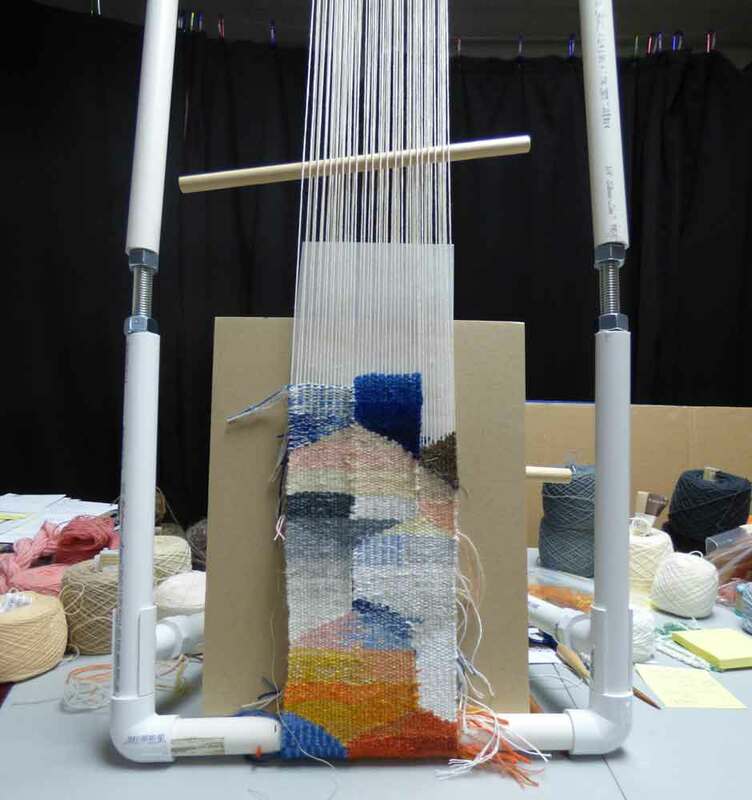 On the PVC tapestry loom, I'm sampling colors and weave patterns for my next big Mary tapestry. 2B. As I sample I am going back to the full-size draft of the cartoon that's in progress on my design wall and making adjustments. It's really cool the way sampling colors has allowed me to approach the design with fresh eyes and sharper focus on what I actually need to know in order to begin weaving. Thank you, Joan Baxter! Here's a detail of the design. 3. 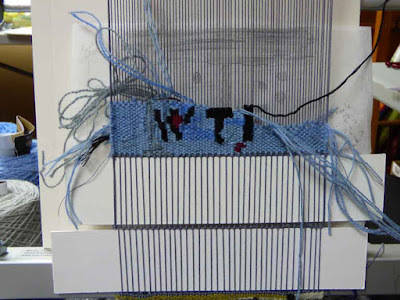 On the Mirrix tapestry loom, I'm making a 4" x 6" tapestry in the series I'm thinking of as modern, miniature illuminated manuscripts, a piece entitled WTF, my response to the horror in Orlando. I'm thinking I need to un-weave and re-do the W and the section around it. Sigh. 4. And then there's the bed quilt I started a year ago, inspired by Turkish tiles and meant to coordinate with the Turkish rug on the floor in our bedroom. I thought I couldn't tolerate the way the current quilt clashed with the rug, but apparently I can. Admittedly, this is a project I work on very intermittently. I'm still appliqueing the right side panel. 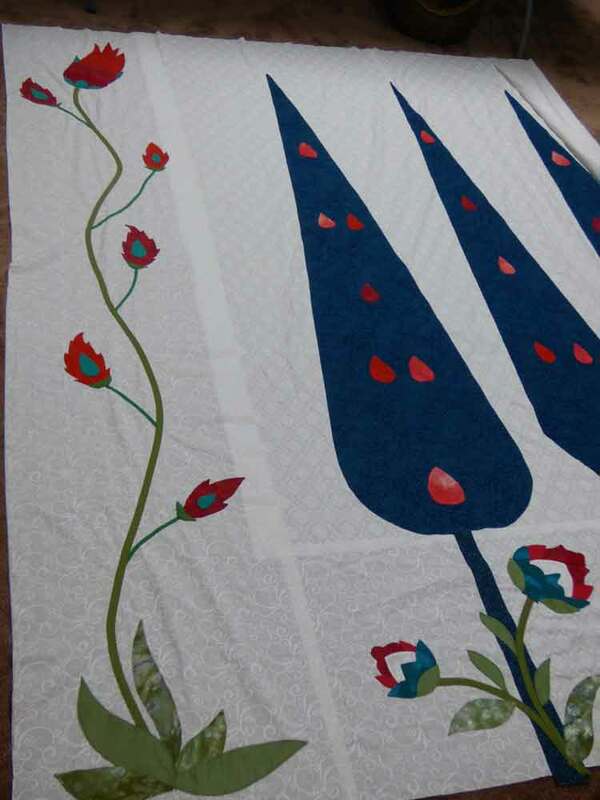 Next steps will be to do the applique border along the top and to seam all the panels together. 5. And you already know about the tapestry diary from last week's post. This is a no-stress project, only requiring 15-30 minutes per day. So it hardly counts in terms of adding to my self-imposed project stress. My son would say at this juncture, "First world problem, Mom." And he's right. I am a very lucky woman to have the time and resources to do this work. 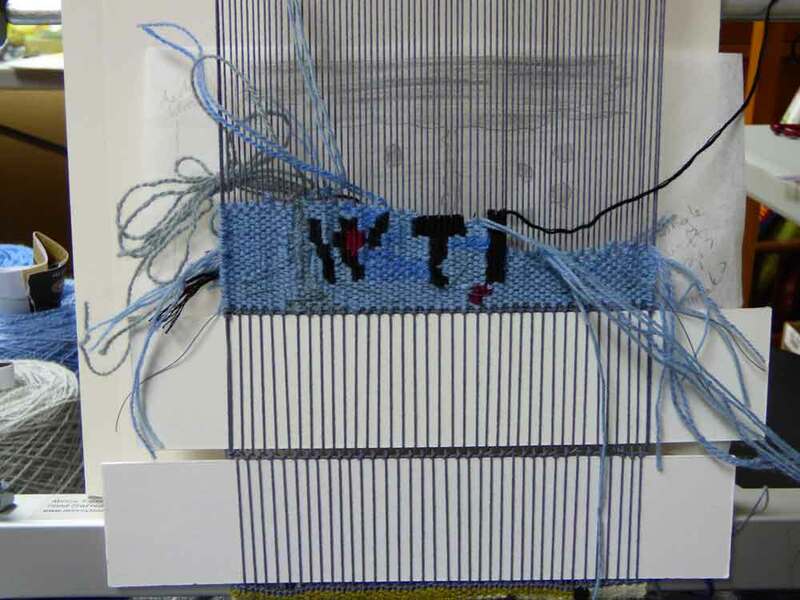 Tapestry weaving though, for me at least, has few periods of relatively automatic weaving. 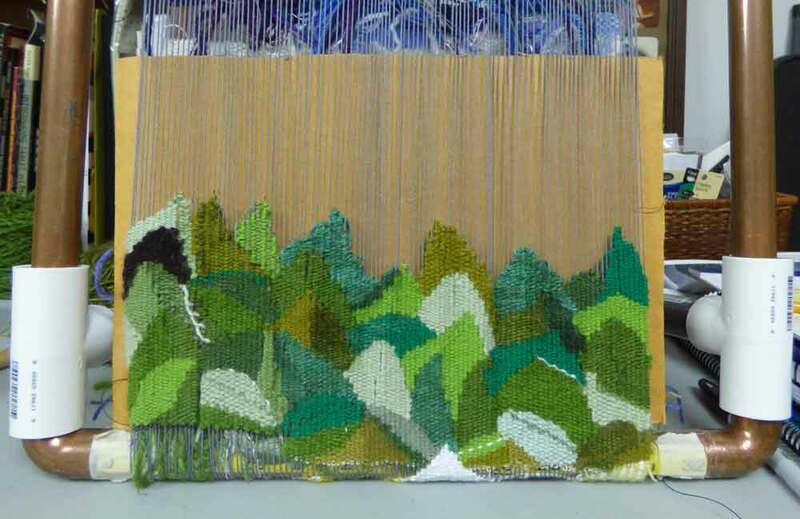 In fact, if I find myself just blissfully weaving along on my tapestry loom, the chances are good I've stopped paying attention to the lines and shapes I'm actually creating. Every pass, every choice about which warp to turn on, counts. 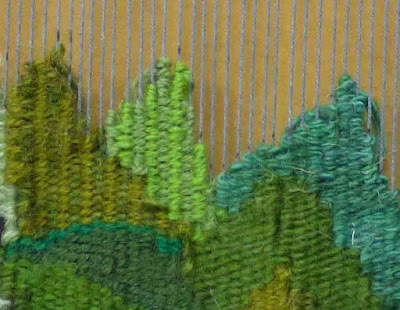 Even on something as straightforward and relatively low-stakes as the tapestry diary, I find that the task of weaving a single leaf--which I will be doing every day for the duration of Ordinary Time, through late November--demands my utmost attention. Where is the tip of the leaf? Where will the central vein go? How exactly can I create the steep vertical curve I want? Which values and shades of green will look best right here? 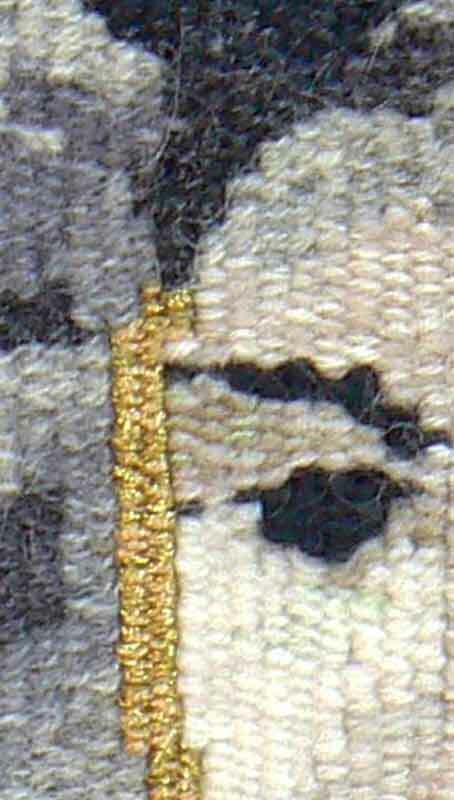 Lately, as you can see in the photo above, I've been inking the warp with dots to outline the leaf I have in mind. When I chose to follow the colors of the church liturgical year in my diary, I had hoped it would be a spiritual practice of sorts. I didn't anticipate the constant, humbling realization that yet again, I need to pay constant attention to what is actually happening, right now, in front of my eyes. To practice being here, now. A meditative practice indeed. 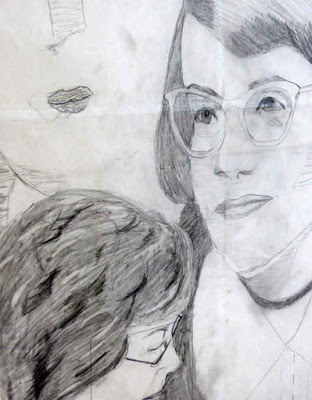 Does you find your own artistic practice teaching you not just about art technique, but about life? Please feel free to share in the comments below. 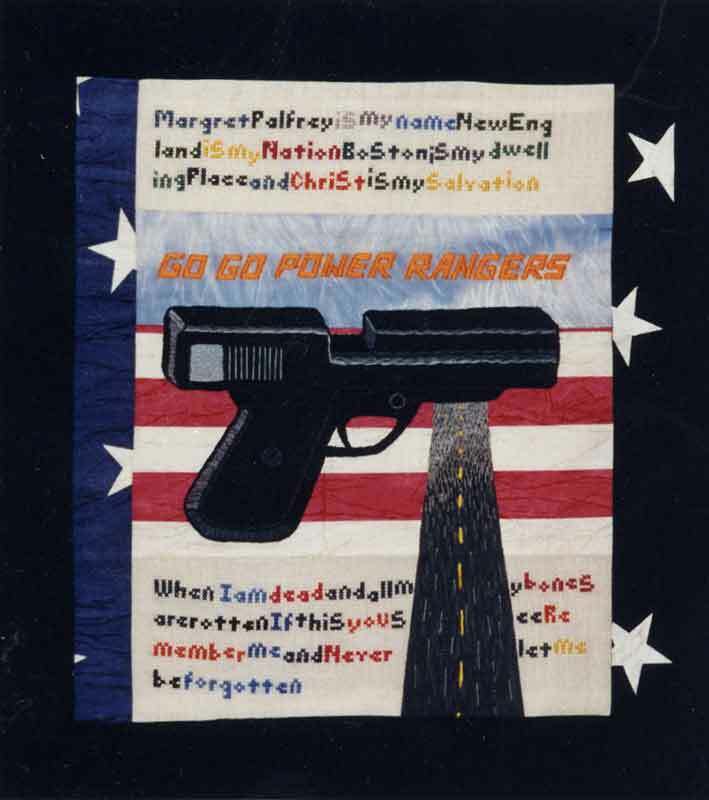 Exactly twenty years ago, while studying art in grad school, I made this piece, based on some research on American schoolgirl embroidered samplers. There had recently been a spate of school shootings. At the time I was also concerned about my young son's fascination with the Power Rangers and about violence in American culture generally. And never let me be forgotten. It grieves me that this sampler is as timely now as it was when I made it. Let us neither forget nor become numb to the senseless violence. 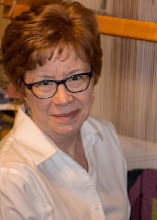 I'm nearly halfway through teaching a series of classes in design at Southeast Fiber Alliance (SEFAA). 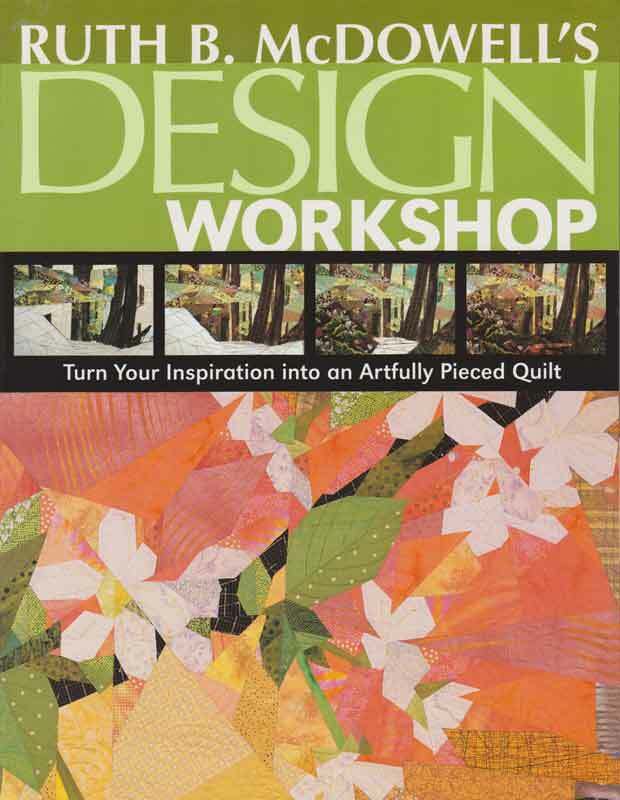 As part of my research and preparation I rediscovered this book by one of my favorite art quilt-makers, Ruth McDowell. As I read I was struck by how similar the process of designing a pieced quilt is to the process of designing tapestry. I shouldn't have been surprised. In fact, when I took a workshop with the master tapestry weaver Joan Baxter over a year ago, she reassured me that my background in quilt-making and collage was actually excellent preparation for designing tapestry design. How hugely encouraging that was to hear! One of the strengths of Ruth McDowell's approach is that she acknowledges the potentially tricky aspects of pieced quilts and suggests ways of tweaking the design so as to avoid these technical pitfalls. Her tweaks actually make for more dynamic and interesting designs, in my opinion. Below you see how a tulip block might be designed in a traditional quilt, with tricky Y-seams and the need to match points. 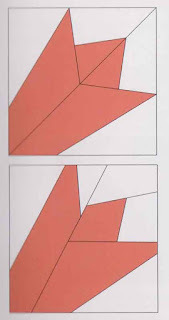 The second diagram shows those seams shifted so that the pieces can be sewn together much more easily--and the design is more interesting for its asymmetry and cropping. from Ruth B. McDowell's Design Worskshop, p. 7. This got me thinking of how important it is while designing tapestry to take the medium's strengths and challenges into account. 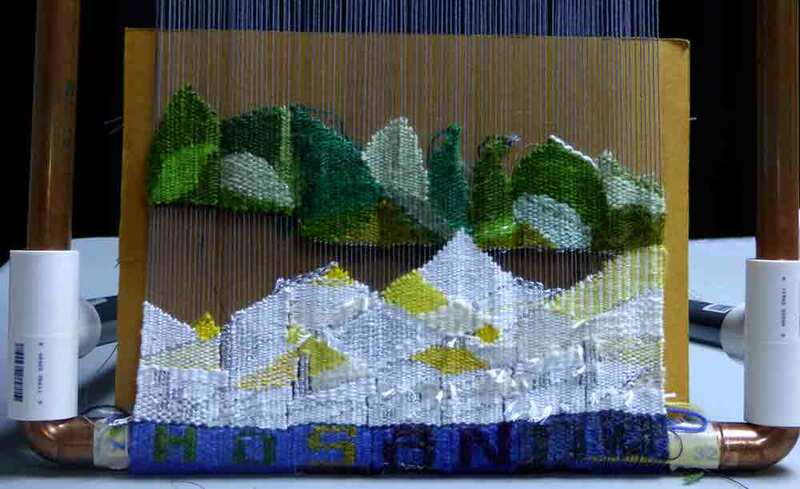 Smooth, gently sloping curves can be difficult to achieve in tapestry. You have a few choices about how to deal with this challenge. You can exaggerate and exploit the steppiness of such curves. 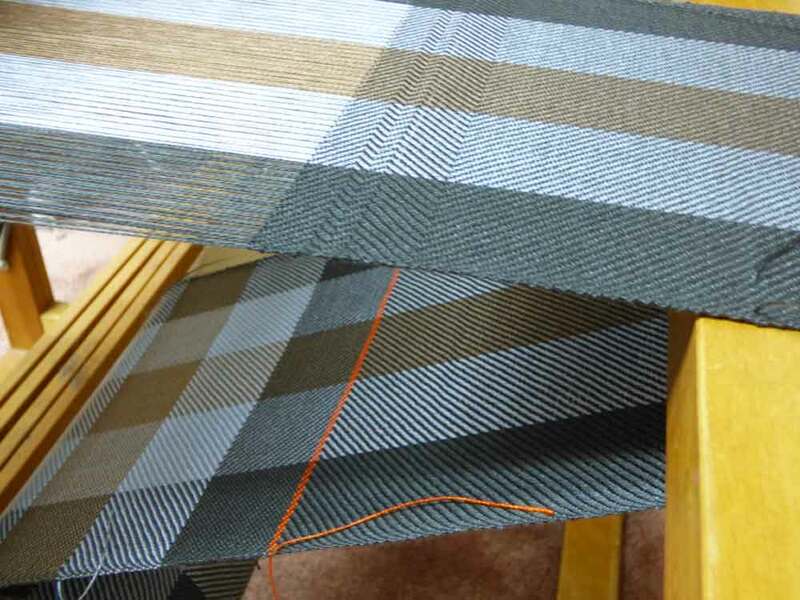 . . or you can choose to weave a piece "sideways" to allow for eccentric weaving and gentler, easier curves. Here's another example: in a quilt, the size of the tiniest design element is dictated by what can be physically sewn together, and the size of this tiny piece in turn determines the quilt's overall size and scale. In the same way, in tapestry we follow the "two-warp rule" so that our tiniest shapes are at least two warps wide, for ease of weaving. 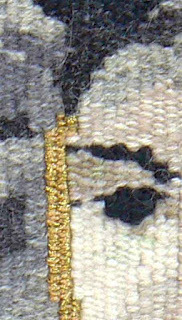 Notice the two-warp stripe of gold at the side of Mary's face below. In both mediums, ultimately the same rules for good design apply: careful planning of areas of light, medium and dark values. 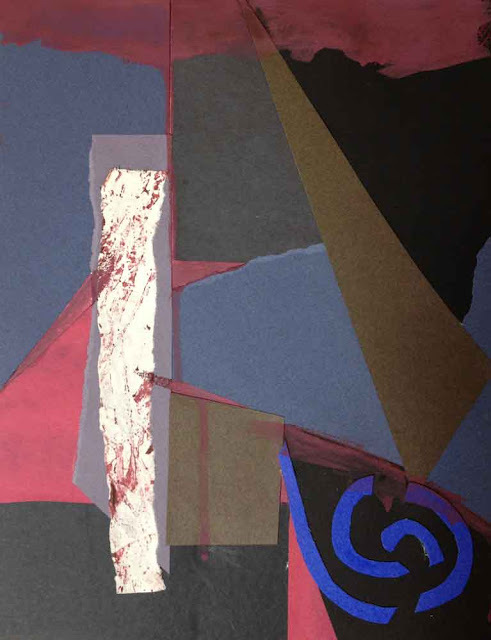 Sensitive construction of shapes and selection of colors. Skillful use of contrast, variety, rhythm, scale and texture. And above all, designing with the unique characteristics of the medium in mind. That's all! Want to know more? There are still some spots available in my remaining Design Modules at SEFAA. Click HERE and HERE to find out more and to register. Now, I'm off to see how I can use these insights as I design my next big tapestry. . . .
We last checked in with my tapestry diary of the liturgical year at the start of the white season of Easter. I decided it was appropriate then to break out of the grid I'd been following and weave triangles, diamonds and other shapes. I bent the color rule a little and used silver and yellow as well. It was really fun to work so improvisationally. Seven weeks after Easter Sunday is Pentecost, the only red day on the liturgical calendar. I'd been looking forward to weaving that single bright patch of red. . . but alas, life intervened and I was away from my loom then. As usual, I left blank warps to show the time away, and when I returned it was Ordinary Time. In church parlance, "ordinary" means "counted" (as in "ordinal") rather than ho-hum or mundane. It is time counted ("First Sunday after Pentecost" and so on) between Easter and Advent on the liturgical calendar. It is seen as a time of spiritual growth, and its color is green. It is the longest season of the liturgical year, running for six and a half months from spring into late fall. In keeping with the idea of growth, and enjoying the small daily improvisation of weaving non-rectangular shapes, I am weaving overlapping leaves for Ordinary Time. This is proving to be hard excellent practice in recalling how to achieve certain diagonal angles and smooth curves. As the season progresses I hope my leaves will become more complex and detailed, but for now I'm focusing on making interesting shapes. In retrospect, I wish I had not started the green season with a straight baseline (especially with that line of white half-hitches--what was I thinking with white??). It might have been cool to allow the leaf shapes to make an irregular angled line that would look better with the irregular top edge of the Easter season. Oh well. One of my rules for the diary is that there is no unweaving, so I'm leaving it as is. This diary will be a true record of growth all right!